I go through phases with eye cream. Sometimes I forget to use it and sometimes I’m obsessed; there is no in-between. For the past few months I’ve been obsessed because I’ve been trying out two eye creams from Love Lula — one budget option, and one high end option. They say: Pack those bags and say goodbye to sleepy eyes! Our clever eye cream contains buckwheat wax, an incredible ingredient to help reduce puffiness and dark circles. Shea butter hydrates and eyebright helps reduce the appearance of redness and brightens the skin. They say: A luscious yet light eye cream that provides a cooling and soothing sensory experience. Super rich Vitamin C from the seed of the New Zealand kiwi works superbly to repair damaged tissue. Assists in tissue repair, hydration and moisture. Clinically shown to stimulate synthesis of collagen production in human skin cells by up to 82%. Serves to improve skin tone and complexion and awaken tired, dull skin. I’ve been using the Laidbare cream on my left eye and the Antipodes cream on my right (for side-by-side comparison purposes) since the end of August. At £7.99 for 30ml versus £24.99 for 30ml, there’s not really a contest here. It’s difficult to choose! The minimal Laidbare packaging with its monochrome colour theme and flash of pink is definitely to my taste, but I also love the luxury of the glass jar and signature Antipodes green. I prefer a tube for hygiene reasons, but there’s something about a jar that just seems fancy. 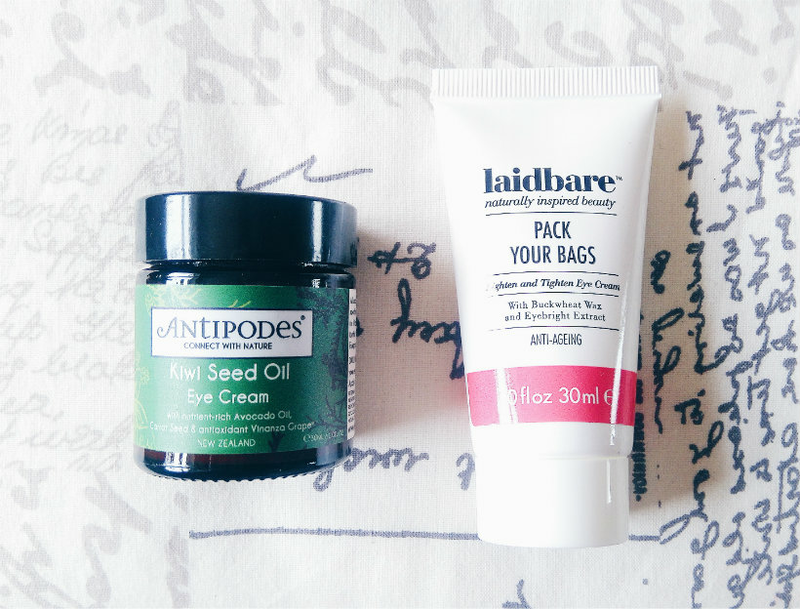 Both creams feel light on the skin and leave it soft and smooth, but the fine, slightly gel-like texture of the Kiwi Seed Oil eye cream means Antipodes just edges it. Uni gave me many things, including two deep lines — one underneath each eye. While they’re both still there, the lines underneath my right eye (the one on the left below) are much less noticeable than they used to be. 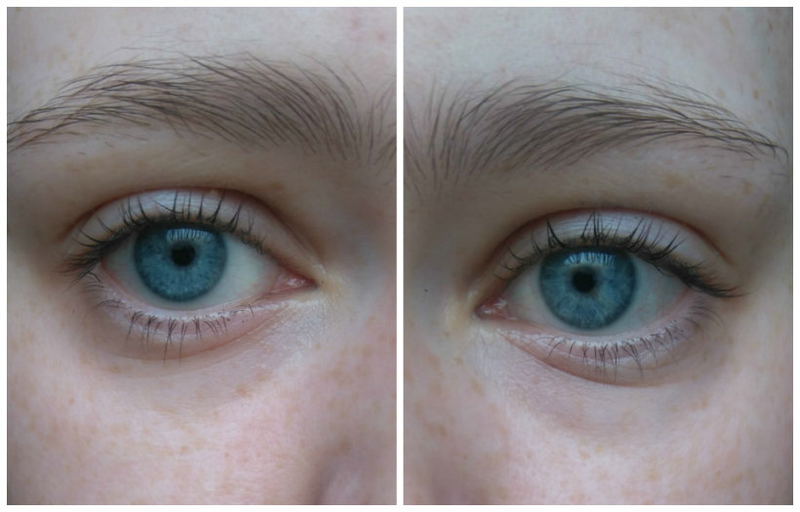 Left: My right eye (Antipodes). Right: My left eye (LaidBare). I haven’t edited these pictures so that you can see the difference in broad daylight. My dark circles are still there and as long as I have to get up at 5:30am, they will be. But they’re definitely fading, especially underneath my right eye (on the left, above). Both creams have 30ml in their respective packaging and neither of them show the signs of running out anytime soon (I tried to use the same amount for each eye). You get your money’s worth with both. I come from a family for whom budgeting is second nature, so I love a bargain almost as much as life itself. But there’s no doubt that Antipodes is the winner here. The Kiwi Seed Oil Eye Cream really is a lovely product that delivers results. That and its longevity make it worth the investment, I believe, if you’re looking to incorporate some high-end skincare into your routine. If, however, you’d prefer to stick to high-street products, the Laidbare eye cream is worth a try. Although the results aren’t quite as significant, it does make a difference to the skin around the eye area, particularly when it comes to softening the skin. And at £7.99, it is certainly not to be sniffed at. Which product would you choose? And do you have a favourite eye cream? Let me know in the comments!